Audi has released these images of its new Q3 ahead of orders opening this autumn. The SUV, which rivals the Volvo XC40, Jaguar E-Pace and BMW X2, follows a similar approach to design as the new A1 while also being bigger and more mature than its predecessor. It will initially be sold in Sport or S-Line trims in the UK, with the latter featuring an exclusive design for the bumpers, sill trims and diffuser creating a sportier look. 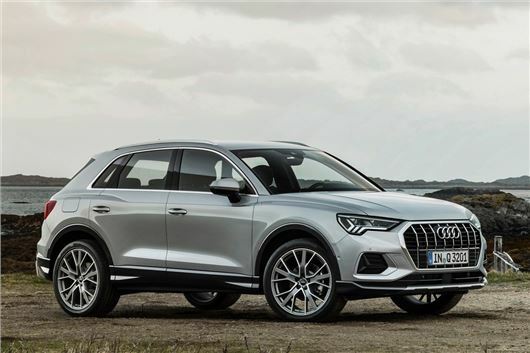 Like the A1, the Q3 inherits certain features from bigger models in the Audi range. The firm's Virtual Cockpit is standard on launch models, for example, replacing conventional dials with a 10.25 inch screen displaying features such as maps and media information. A 10.1-inch display is standard and will be familiar to anyone who's sat in an A8, while Audi's claiming its voice control system understands natural language in a similar way to Amazon Alexa. Ask it questions such as 'where's my nearest supermarket?' and it uses the internet to provide results. A smartphone app will allow you to plot routes via the car's navigation system from outside the car, as well as remotely lock and unlock the car and pinpoint its location. In a bid to appeal to the digital-savvy family, Audi's also offering two USB ports in the front and rear of the car. The Q3's larger dimensions translates to more interior space, with 'considerably more knee room, headroom and elbow room', says Audi. The three-seat rear bench can be moved backwards and forewards by 150mm depending on whether you need to prioritise room for rear passengers or boot space, while the rear seat backrest can be split 40:20:40 and tilted in seven stages. Four engines will be offered at launch - three petrols and one diesel, with power ranging from 150PS to 230PS. The entry-level 1.5-litre petrol (badged the 35 TFSI) produces 150PS and 250Nm of torque and uses cylinder on demand technology to deactive two cylinders and provide better fuel economy under light loads. At launch, it will be available exclusively with front-wheel drive and a seven-speed S tronic automatic gearbox, with a six-speed manual following later. There are two version of the 2.0-litre petrol engine. The first is available with 190PS and 320Nm of torque, badged the 40 TFSI, or there's the 230PS and 350Nm, badged the 45 TFSI. Both engines comes with the seven-speed S tronic transmission and Quattro permanent all-wheel drive. The only diesel engine available at launch is a 2.0-litre unit producing 150PS and 340Nm of torque. Badged the 35 TDI, it will initially come with a manual gearbox and Quattro all-wheel drive. An automatic version will follow along with front-wheel drive, as well as a 180PS version. Audi's yet to announce pricing for the new Q3, although expect a small increase compared to the current £27,915 start price. Dealers will be taking orders this autumn ahead of deliveries starting late in 2018.